Ralph: If we had known that there was a location of the Machine Shed in Davenport, Iowa, we would probably have pressed on to eat dinner there on Tuesday night. (And if we had had perfect foreknowledge, we would have taken advantage of that to visit the John Deere Pavilion in Moline, IL to learn more about modern farming, because we discovered on this trip how little we city mice actually know about understanding the farms we see.) But if we had done so, we would probably have never visited the Giant's Den in De Pue, Illinois, and we enjoyed our visit there. 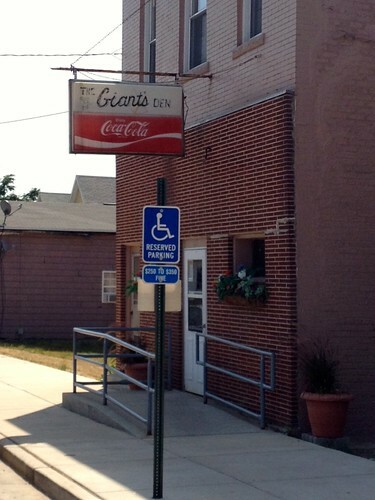 The Giant's Den is one of the major restaurants in De Pue, which is a small town of under two thousand residents. The sign makes clear that this is not the sort of restaurant that depends on flashy advertising to get its custom. 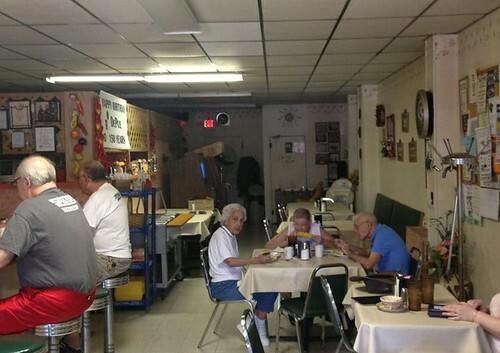 And when we stepped inside, it was clear that this was one of those small-town restaurants that serves double duty as a senior gathering center, where everyone in the restaurant knows each other. 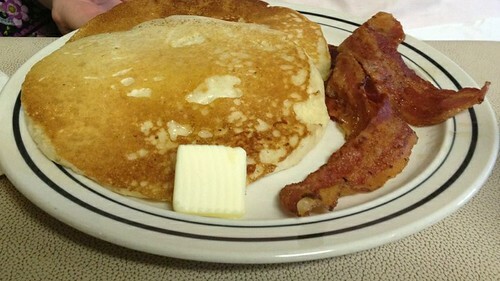 Lori enjoyed her pancakes and bacon. The special of the day was enchiladas. I passed on the enchiladas, because I didn't expect to find great Tex-Mex in rural Illinois. But I was wrong to be so prejudiced: we found out after our meal that the cook is from Brownsville, Texas, which raises my expectations for her Tex-Mex cooking considerably. 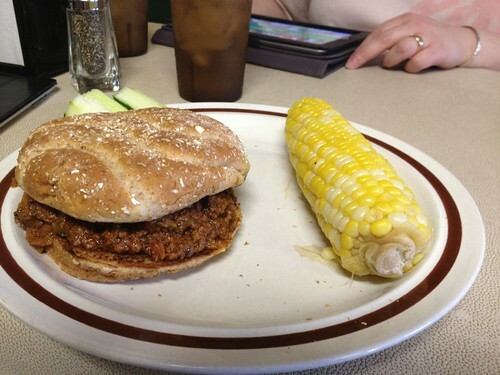 Instead, I ordered the ground beef barbecue with corn on the cob. The barbecue was beef and sauce, nice but not outstanding - but the fresh corn was splendid. 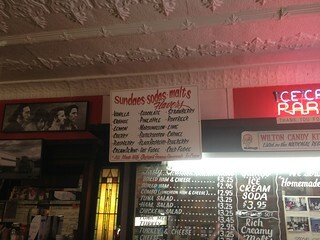 Our next stop was the Wilton Candy Kitchen, the world's oldest soda fountain. 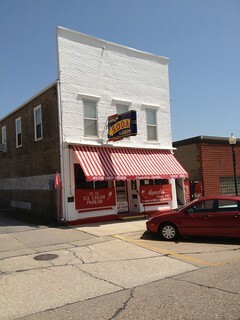 Lori: We next visited the Wilton Candy Kitchen, in Wilton, IA. 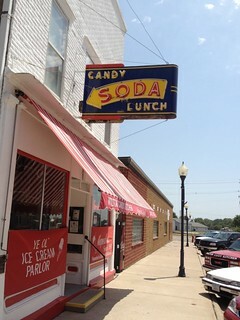 I'd really been looking forward to seeing this real, old-fashioned soda fountain, and it did not disappoint. The interior boasts the old-fashioned glass candy case, marble soda fountain and little booths with a small Tiffany lamp lighting each one. 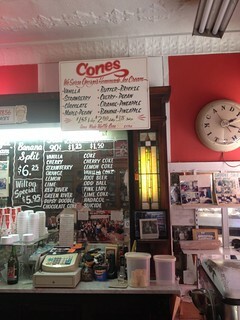 We sat at the soda fountain, the better to see what was going on and to chat a bit with the proprietors, George and Thelma Nopoulos. Unfortunately, George was leaving to do some errands as we arrived, but we had a nice time chatting with Thelma and watching her train a new employee in the special lore of working their classic soda fountain. 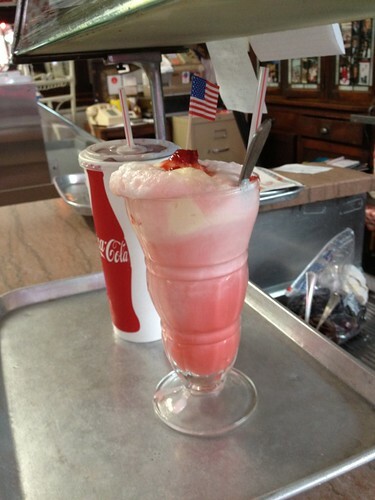 "You have to tip the glass like this," Thelma instructed the young lady as she assembled an ice cream soda. Tipping the glass would ensure a good mix of syrup, soda water and ice cream. 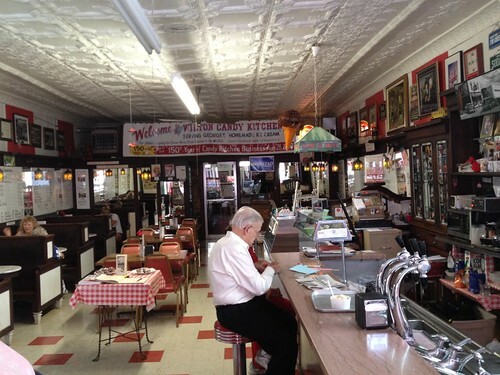 Thelma chatted pleasantly with us, pointing out pictures of some of the famous folks who have visited the Wilton Candy Kitchen, and telling us that her first job was washing dishes at the soda fountain when she was sixteen and George's father owned the shop. She also explained with a smile that theirs was an arranged marriage, so first they married, then they fell in love. While taking this all in, we enjoyed our ice cream and sodas.I sampled the Pink Lady, a lovely rose-colored drink with strawberry, cherry and vanilla syrups. It had a lovely, soft taste totally unlike most bottled sodas we've tried. I also had a sundae -- vanilla ice cream with chocolate and caramel toppings, which were thick and lovely accents to their sweet vanilla cream. Ralph had a Dipsy Doodle soda, which was all the fruit-flavored syrups at the fountain plus vanilla. It was, as you might expect, fruity and colorful. 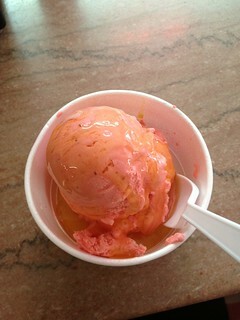 Ralph enjoyed a dish of their cherry pecan ice cream with butterscotch topping. I'd have loved to try candy made at the store, but alas, the molds are in the attic and they now bring in their candy from other suppliers. As we drove off from our delicious stop at this vintage soda fountain, I found myself wondering how many first dates and stolen kisses have transpired there. It was easy for me to imagine it on a summer's evening during its heyday, with couples sipping sodas and music pouring from the jukebox. Ralph: One other note about our chat with Thelma: I had brought in my iPad to consider our next plans (and keep it from overheating in the car), and I ended up showing Thelma the website for the Wilton Candy Kitchen. She told me that they had no computer, and I inferred that this was the first time she'd seen their website. 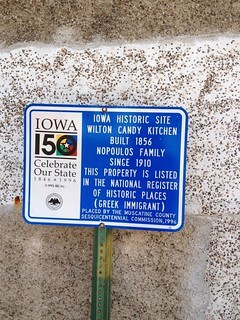 We had spend enough time at the Wilton Candy Kitchen that some of our other Iowa plans seemed impractical. We had had plans of detouring north to see the Field of Dreams site or the Matchstick Marvels Museum, but we thought that we wouldn't have time to get to either site in time. 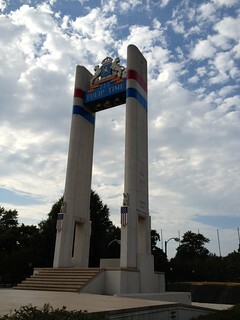 I thought, though, that we could get to the Kellogg Historical Museum. I was wrong; we got there at 4:45, and the museum had closed at 4:00. 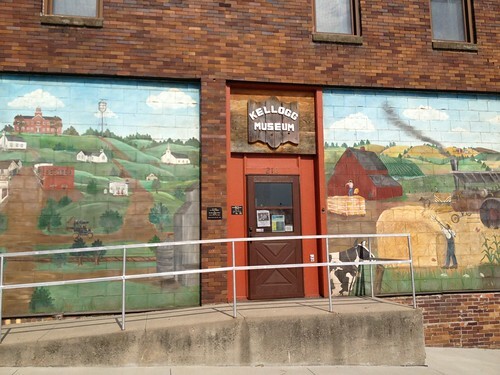 So we looked about for other options, and discovered that Kellogg was only half an hour's drive from Pella, home of two Roadfood-listed restaurants. We called In't Veld and discovered that they closed at 5:30. So I drove there as briskly as possible (with the GPS predicting that we would arrive at 5:28) while Lori called Jaarsma Bakery to find their hours. Jaarsma Bakery would close at 6, so our strategy was clear. Downtown Pella is a cute little town square, with lots of Dutch architecture. Despite my fears, In't Veld received us warmly with no indications that they were preparing to close for the night. 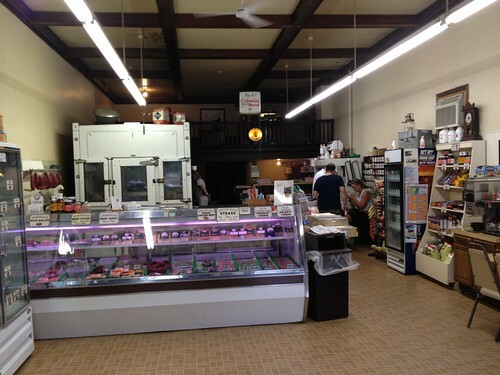 We explained that we had come because we had heard about Pella bologna, and the counterman gave us some samples. We immediately saw that this was no ordinary bologna, and we purchased some bologna, smoked Gouda cheese, and crackers for a snack. I enjoyed our conversation with him, but unfortunately, all I remember from that conversation was that he explained the name In't Veld: it's Dutch for "in the field". This is Pella bologna. 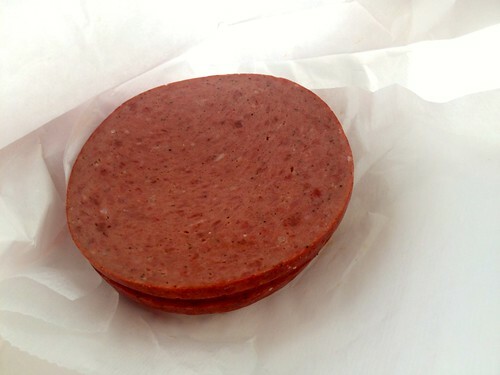 It has a rugged texture and a strong flavor of beef, smoke, and spices; this is a far cry from Oscar Mayer bologna. 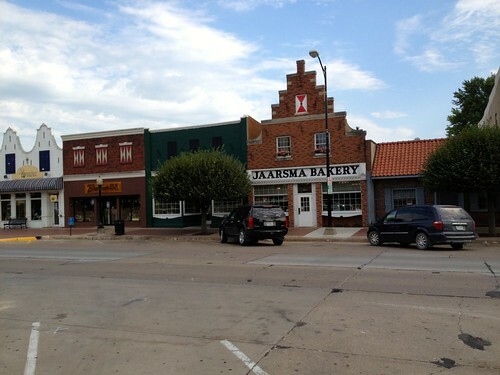 From there, we hurried across the square to Jaarsma Bakery. 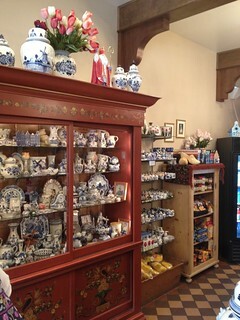 Lori was distracted briefly from the bakery by the antique store in the same space. 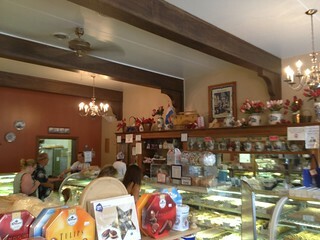 But the bakery was interesting enough that it won out at last. 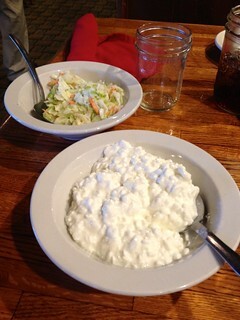 We had a lot of trouble deciding, and we kept adding things to our order. 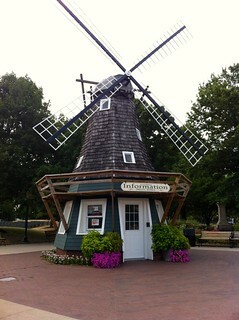 We decided against the loaf of wheat bread, even though the wheat had been ground in Pella's Dutch-style windmill. But we persuaded ourselves that a loaf of apple bread would make a good breakfast. (We were right. It was soft, moist, and very apple-y.) 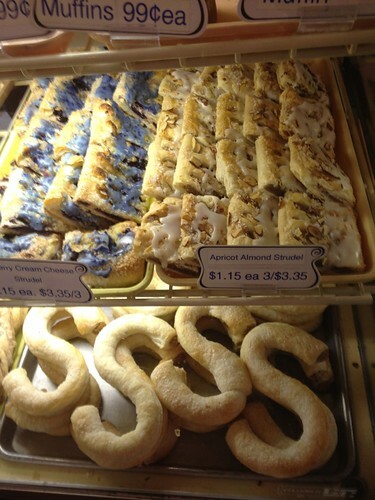 And I certainly wanted to try a Dutch letter and an apple ring. And Lori thought the peaches and cream strudel was delightful. 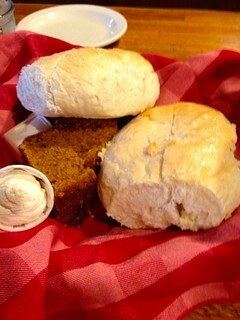 And the puff pillow was unfamiliar to us and a daily special, so how could we resist that? We ate our "snack" (now grown fairly large) on a picnic bench in the town square, as the heat of the day just started to ease a bit. 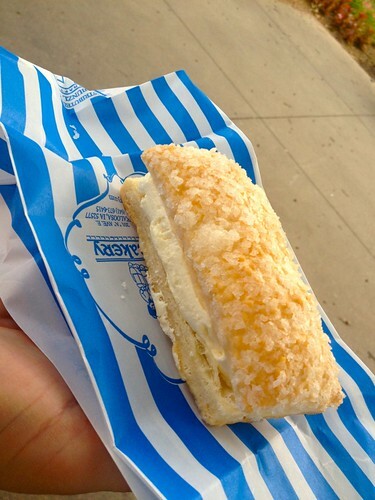 This is the puff pillow: a sandwich of light cream filling between two layers of flaky pastry. I expected this to be prone to layersquish, such that the first bite would squeeze cream filling out the back. I was wrong. The pastry was so amazingly tender that you could bite through it without squishing the filling at all. Strudel, too, is often prone to layersquish. But this strudel used the same tender dough, and it was wonderful. 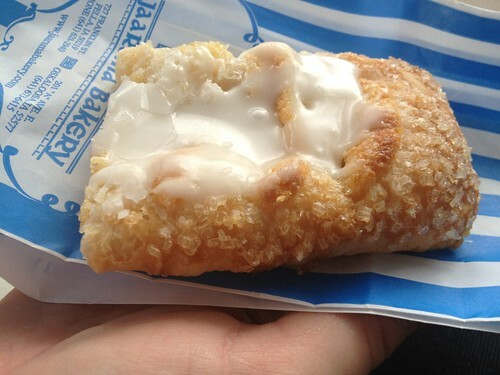 This strudel was better by far than all other strudels I have tried. This picture shows the Dutch letter and the apple ring. 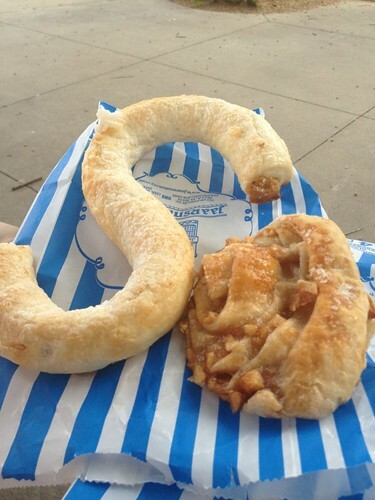 The Dutch letter used more of that fine pastry, wrapped around a nut filling; the apple ring wrapped that dough into a spiral with lots of apple bits. These were both very good, well worth getting again, but the puff pillow and the strudel were even better. 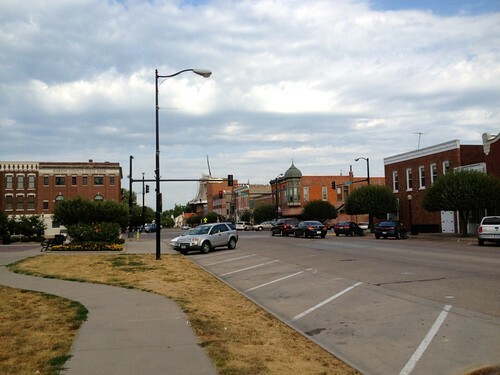 We really enjoyed everything we saw and ate in Pella, and we wish that we could have spent more time there. 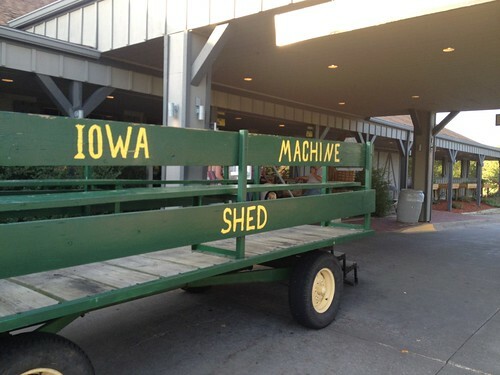 But we had four hours of driving still to go, and one more Roadfood-listed restaurant I wanted to visit that day: The Machine Shed in Des Moines, IA. We got there just as the sun was getting low enough that I was glad not to be driving east anymore. 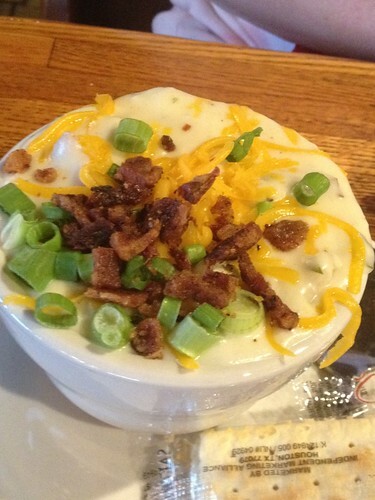 Lori's potato cheese soup was delicious, with firm chunks of potato, lots of cheese, and some really outstanding bacon pieces. I had ordered the barbecue brisket stuffed potato skins as an appetizer, but they didn't arrive until just after our entrees. As I ate them, I realized that I had suckered myself with their description of potato skins stuffed with "our eighteen-hour smoked brisket." I smoke brisket for eighteen hours myself - or more or less, if it needs it. So if "eighteen-hour" means anything other than marketing fluff, it means that they cook their brisket according to a timer instead of paying attention to the variations of individual briskets. 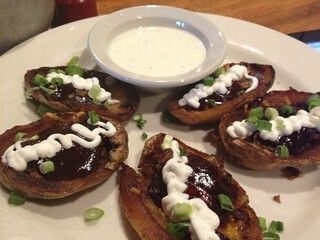 The potato skins were not good enough to distract me from my internal tirade. 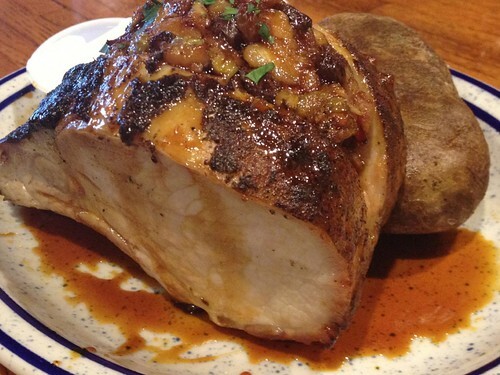 I ordered the stuffed pork chop, a softball-sized hunk of pig that took up most of its plate. It was, frankly, a massively unwieldy meal. There was no possible way to generate a forkful that contained both pork and stuffing. I tried sawing lightly at the chop, but that sent stuffing scattering across the plate (a perfect example of layersquish). The meat was tender enough that I could cut through it by pressing down on the knife, but the bones at the bottom prevented me from completing a bite that way. I ended up savaging it until chunks of meat lay around the plate and I could eat at them like a scavenger picking at the scraps of a carcass. The meat was tender, but it was very mild, without much flavor of note at all. I was very disappointed by this Iowa pork chop experience. 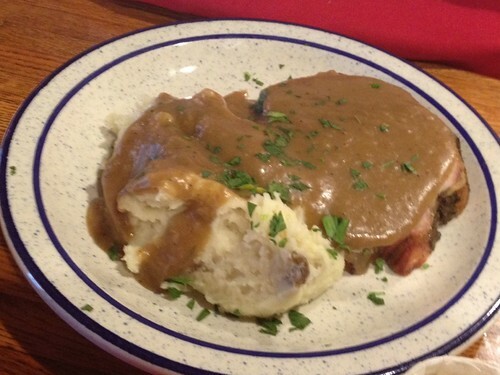 Lori's "award winning" pork loin and gravy was more to my taste, but nothing special. We didn't finish our entrees, but we were willing to consider dessert. But the disinterested waitress dropped our check off without asking us, and we were so disappointed by the entrees and the service that we decided we would rather leave than try to extract dessert.